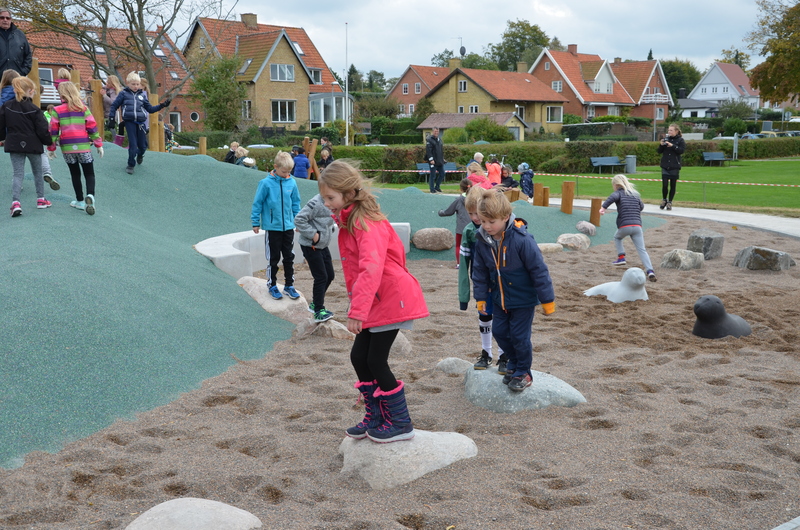 Fifty expectant children from the local Klostermark School in Roskilde were ready to be the first kids to try out the playground after the opening speak by Torben Jørgensen, chairman of the Planning- and Construction Committee, Municipality of Roskilde. The starfish playground is located next to The Viking Ship Museum and the beautiful Firth of Roskilde and with a wonderful view to Roskilde Cathedral, a UNESCO world heritage site. The unique playground is shaped like a large starfish – 23 meters in diameter and 1.5 meters at its highest point. The new playground, which is the only one of its kind in Denmark, has five smaller rooms between the starfish arms with play elements that challenge children’s motor skills. The design makes it possible for several groups of visitors to play there at the same time. Between the arms there are climbing nets, a nest swing, a carousel, big boulders and Viking shields to balance on. There’s a small ship and seals from Danish artist Lissy Boesen that refers to the location at the firth. From the top of the starfish one can slide, and one of the starfish arms has a tunnel to crawl through (or hide inside). The many items together form a long “jorden-er-giftig” challenge (the floor is lava) that makes it possible to get around the whole circle without touching the ground. The project was designed to Roskilde Municipality by Helle Nebelong. Christina B. Zingenberg, Roskilde Municipality has worked hard with great commitment to getting the playground realized and UNO has built the complicated starfish shape with all its elements. To Helle Nebelong it has meant something special to design a playground in Roskilde. Her father N. C. Nebelong was born and raised in Roskilde. He would have loved to know that his daughter has now designed a playground for the children of his beloved childhood town.